WASHINGTON -- US President Donald Trump insisted Thursday he is “very well-prepared” for a historic and potentially fraught summit with Kim Jong-un in five days, while hinting at the signing of a peace treaty and even a future White House visit by the North Korean dictator. Trump is set to meet Kim in Singapore on Tuesday, a first-ever meeting between sitting North Korean and US leaders and one focused on Pyongyang’s ominous nuclear weapons program. Abe jetted into Washington hoping to ensure a decades-old tough united front on North Korea is not swept away by the history of the moment. 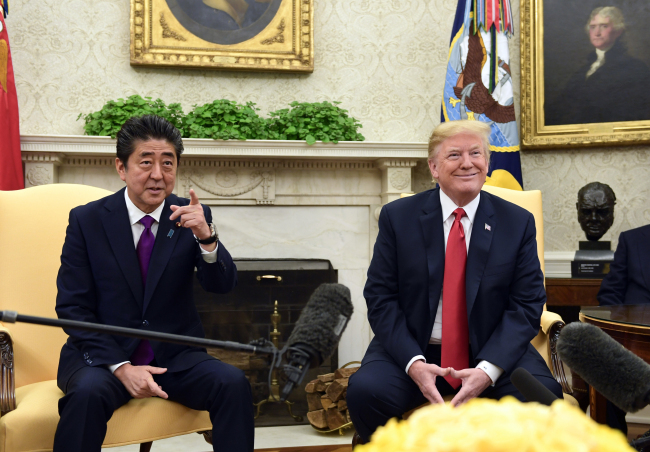 The Japanese prime minister will have been encouraged by Trump’s insistence -- during a joint Rose Garden press conference -- that the summit will be only the start of a process and his vow to raise the issue of Japanese abductees in the North. But in their joint appearance, the mercurial US president also displayed his instinct to make the sensitive, technical diplomatic effort into a dramatic world-stopping event. Trump mused that he was willing to consider normalizing ties with North Korea, that a peace treaty to formally end the Korean War could be signed in Singapore and that a leader accused of gross human rights violations could visit the White House. Although an armistice was signed to end the war, there was never a full peace treaty -- something that fuels the North Korean regime’s fears about its own security. Trump even went so far as to say he would consider inviting Kim to visit the United States if the June 12 summit in Singapore goes well. “Maybe we’ll start with the White House, what do you think?” he said when asked if Kim would be invited to Washington or his Mar-a-Lago estate in Florida. The Japanese leader said he too was willing to have full relations with North Korea, but not before key demands were met. “I wish to directly face North Korea and talk with them so that the abduction problem can be resolved quickly,” Abe said. Before leaving Tokyo, Abe clearly outlined what would need to happen for the summit to be a success: tangible progress on curbing the North’s nuclear and ballistic missile programs, as well as answers about the Japanese nationals kidnapped by Pyongyang in the 1970s and 1980s. For Richard Armitage, a former senior diplomat in the George W. Bush administration, Tokyo runs a very real risk of finding itself out in the cold after the Trump-Kim talks. “We should absolutely prevent decoupling Japanese and US security,” he told Agence France-Presse. Trump’s meeting with Abe comes ahead of what promises to be a tense Group of Seven summit in Canada, clouded by the US leader’s aggressive trade policies. Japan had hoped to convince the US to shield it from fresh tariffs on steel and aluminum imports, and did not hide its bitter disappointment when those talks failed.